This dressing is especially great for taco salads or any salad with leftover meat or hard-boiled eggs on it! *Check out our Grocery Shopping Guide for our tips on selecting the most additive-free versions of every ingredient used in our recipes. Whisk ingredients together in a bowl. Use a funnel to transfer to a storage bottle. This recipe makes about 1 cup. If you try it and like it, save time by making a quadruple batch (which will fill a 32 oz. jar as shown here – although filling a bottle that full does make it difficult to shake it well); it will also use nearly the whole 6 oz. can of tomato paste, too. Please try it, and comment below to let me know how you like it! This entry was posted in Grocery Selection & Safe Products, Recipes and tagged additive, bragg, catalina, dorothy, dressing, food, free, french, geek, grocery, homemade, lynch, meal, natural, omaha, recipe, salad, vinegar. Bookmark the permalink. Is this similar to Dorothy Lynch? Yep! That’s what we use it for (not that anything can compare to good ol’ Dorothy, though. lol). I just made this. It is SO DELICIOUS! Mine looks more red than orange, I’m still in the process of replacing some of the items in my kitchen, so I used chili powder with mystery “spices.” Anyway, thanks for the recipe and the encouragement to eat better. Love your blog! @Janet – Thanks for the feedback. I’m so glad you enjoy the recipe and the blog! Keep up the good work; you’ll get there! Any thoughts on how long this will keep for once prepared? This is absolutely delicious! Thanks for the great recipe. I am just restarting anew on my natural eating journey. I had started slacking off, not really reading labels or researching, just counting on purchasing certain brands and trusting them when they said “natural”, “real” or any of the other trick phrases they are using to slip crap past us. I started feeling lethargic, nauseaous, generally unhealthy and decided to start refining my diet and taking better care of myself from the inside out. Your blog is a great resource. Keep up the great work! i know this is an older post, but i just wanted to let you know our family has been using this for a while now. It’s a great recipe! I’ve even used half the honey and half stevia and it is great. We use it for a ketchup type dip, salads, and tacos. Thanks for sharing. Loved it! I used stevia. I love honey, though. I’ll try that next time. Thank you so much!! Not too bad…. sorry but I added a little sugar too, to sweeten it up past the honey level. Also put in some home made mayo. Just awesome. Added fresh cilanto to half and used in on grilled chicken… the rest on cucumber saald with fete cheese. Yup!! It’s good. The only thing I did different was add more spice than it called for and I added some brown sugar because it just wasn’t sweet enough. I think maybe it’s my olive oil. It is unfiltered and really strong so I had to make up for it. Thank U! Thank you! I have avoided salads for years because vinegar worsens my chronic migraine. All of the other Catalina copycat recipes I found used ketchup, which always has vinegar. I just subbed lemon juice with this recipe. The raw honey taste was a little overbearing for me (I’ve never been big on honey), so when I made it again I used unbleached organic cane sugar. I put this over a bed of Romaine lettuce with some tomato, apple, and strawberries. Awesome! I’m so glad it helped you out! :)Thanks so much for commenting! I like your lemon juice idea! I rarely get migraines anymore due to taking Verapamil 240mgs it’s a mild blood pressure med, I used to take Inderal which is a muscle relaxer for the heart, and it also words great for keeping migraines at bay, plus I’ve had no side effects from either, and I get side effects from almost everything that’s not derived from a natural ingredient. Any who, I wonder is swerve sweetener would work as well. I’m not a fan of honey, plus I have auto immune disorders so I stay away from sugar, bad sugar even healthy sugar is sugar. I’m trying or thinking of trying the ketone diet. Carbs being sugar. Thanks for the ideas! Hi, I’m looking for a healthy version of a Catalina, this looks great. Although can you help me out with the difference of it being a Catalina and French? I need a Catalina style for a taco salad and not sure if this will work? Absolutely delicious! Any idea of calories in this dressing? We don’t focus on calories at all anymore…just clean eating….so I can’t help ya there. This is soooo good! Thanks for a great recipe. I have now made this many times. It’s a family favorite. I wish I had spotted your recipe before I used one of the recipes with ketchup and sugar. 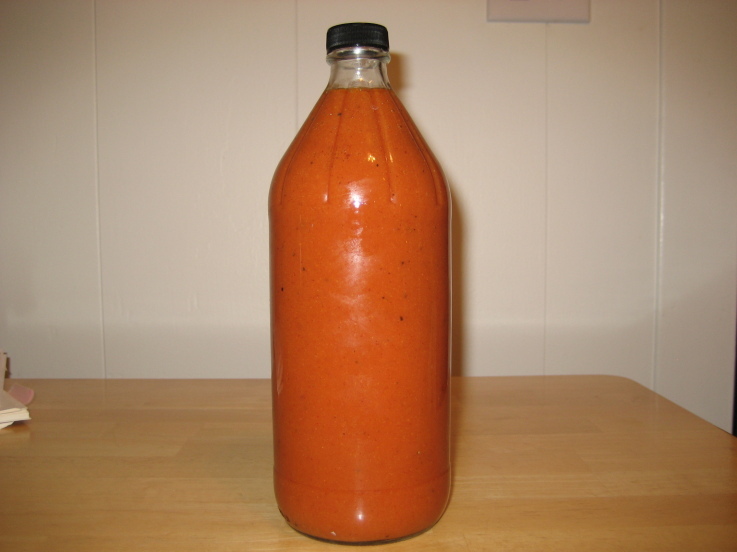 I needed a recipe for french dressing to marinate a tri tip for the bbq. It is very sweet and my tri tip is already marinating. The thing I liked about the recipe I used was that it called for fresh onion and fresh garlic. Do you think that your dressing would be good for a marinade with the added fresh onion and fresh garlic? I put all the ingredients in my food processor and also added home grown and dried cayenne pepper. How long can I store it in the fridge for before it goes bad? Hi, my family and I loved this recipe! Would like to know if it needs to be stored in the refrigerator or can it be stored at room temperature. I put the leftover dressing in the fridge for four days and it seemed to congeal and change consistency, didn’t know if that’s normal.